Physical chemists at Pacific Northwest National Laboratory pulled off this design trick using a "soft-landing" technique that disperses the tiny protein coils onto a waiting surface. The small proteins called peptides are of a variety that normally takes the shape of a coiled spring or helix in gas phase. The method used by PNNL's Julia Laskin and Peng Wang delivered ultra-pure helical peptides to the surface and trapped them there. 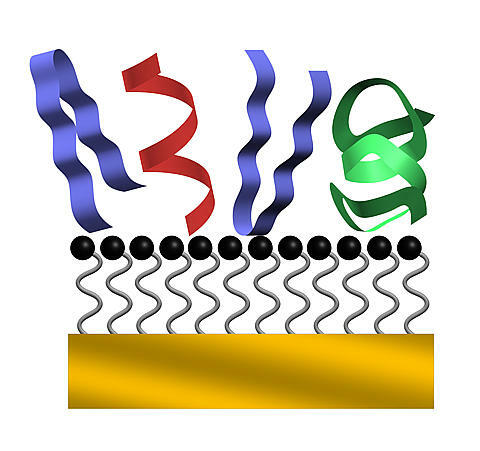 Solar cells and proteins need for helices. Researchers have been trying to make thin films of helical peptides for many years. Because the peptides line up in an orderly fashion, the overall chemical nature of the thin films makes them useful for a variety of technological applications. They can be modified with light sensitive molecules and turned into components of solar cells; or designed to change shape when a current is applied for molecular electronics. Also, the helices themselves can be used to elicit cues about how proteins function. Would soft landing produce helices? 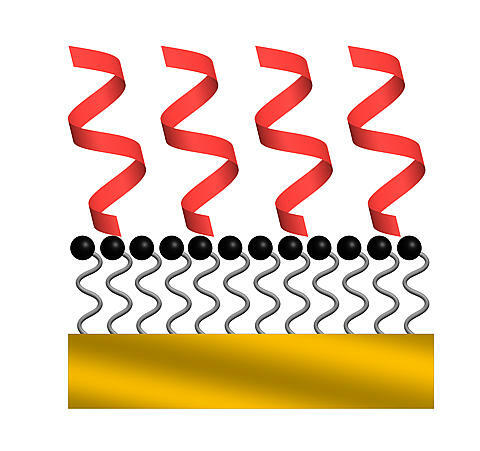 After making the thin films out of generic peptides previously, Laskin and Wang wanted to use the soft landing method to make a film out of helical peptides, and compare it with a more common method called electrospray. To do so, Laskin and Wang began with peptides made almost entirely of the amino acid alanine. Due to alanine's chemical nature, long chains of it naturally form so-called α helices. The researchers ended the alanine chain with the amino acid lysine, which stabilizes the helix and allows the coiled chain to be chemically attached to the surface. Working with a specially designed mass-selected ion deposition instrument at EMSL, DOE's Environmental Molecular Sciences Laboratory on the PNNL campus, they deposited the peptides on the support layer in one of two ways, starting either from a liquid form for electrospray or from a gaseous mixture for soft-landing. In each case, the chemists began with the peptides (either in liquid or gas), zapped them to give them a slight electrical charge, and blew them onto the surface. When the chemists examined the peptide shapes in the solution and the resulting thin film, they found, unexpectedly, that most of the peptides failed to form helices. Instead, the majority of peptides took on a flat shape known as a β sheet. The dearth of helices in liquid form surprised the researchers. When the researchers next used soft-landing to form thin layers, they didn't know if the peptides would form helices before landing on the surface. "Because we were starting from something that wasn't α-helical in solution, we were a little pessimistic whether it would work at all," Wang said. But work it did. Depositing the peptides with soft-landing, the chemists found that nearly all of them alighted as helices. In addition, they could chemically connect the helices to the surface using a related technique called reactive-landing. When the chemists treated the thin layer with sound waves to test how easily the peptides fell off or changed shape, they found that some loosely bound peptides fell off, but those remaining retained their helical forms. What's next? Next, the team would like to create thin peptide layers using different support surfaces and a different mix of peptide shapes, to learn how to control the design of the thin films precisely. Acknowledgments: This work was supported by PNNL discretionary funding, know as Laboratory Directed Research and Development Program, and DOE's Office of Basic Energy Sciences, Chemical Sciences Division, part of the Office of Science. This research was featured in August 21, 2008, online news, Analytical Chemistry. The research was done in the U.S. Department of Energy's EMSL, a national scientific user facility located at PNNL. This work supports PNNL's mission to strengthen U.S. scientific foundations for innovation by developing tools and understanding required to control chemical and physical processes in complex multiphase environments. Citation: Wang P, and J Laskin. 2008. "Helical peptide arrays on self-assembled monolayer surfaces through soft- and reactive landing of mass-selected ions." Angewandte Chemie 120(35):6780-6782. DOI 10.1002/anie.200801366.